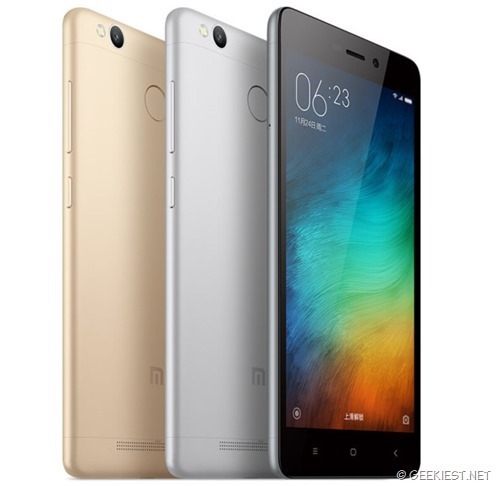 After the Redmi Note 3 and Mi 5 Xiaomi announced another new phone Redmi 3 Pro. This will be a phone with 3GB RAM and 32 GB internal memory. Redmi 3 Pro will be powered with Snapdragon 616 octa-core processor (Quad-core 1.5 GHz Cortex-A53 & quad-core 1.2 GHz Cortex-A53) and & Adreno 405 GPU. It will be having a massive 4,100 mAh non removable fast charging battery. The display size of the device will be 5 inch. 13 Mega pixel primary camera with LED flash. The redmi 3 Pro will be available in 3 colors Dark Gray, Silver and Gold. The device is announced in China and the price will be 899 Yuan which will be approximately equal to $138 (Nearly INR 9250). There no information about the availability in any other country other than China. New Xiaomi Redmi 3 Pro price and specifications.